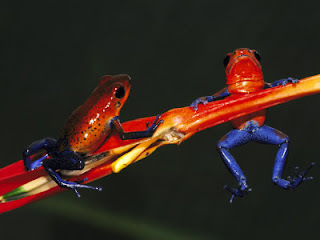 Poison dart frogs, one of the world's most vivid creatures. Image via The Incredible Weirdness of Being. Vivid (and its linguistic cousin, vivarium, which I'll get to in a minute) is one of my favorite words. It comes from the Latin vivere, "to live," and it was originally used to mean "lively" or "spirited" in the sense of an animal or a person - which is kind of interesting in itself, actually, because distinguishing a being as "lively" is kind of like saying they have extra life, since we as living things have a base measure of life already. So, at the root, vivid really means "more alive" or "extra alive." What is it, that measure of extra life, I wonder? What do we actually look at to decide whether something has it or not? It's not just energy; I think something can be energetic without being especially vivid, like a Jane Fonda workout video, or a politician. Later on, the word vivid came to be used on colors that were especially bright or strong, and as time went on we started using it for all sorts of things - emotions, dreams, experiences, smells. We use it mostly in the sense of intensity, something being very detailed or powerful or bright. And in some way we forget what it really means, that when we say something is vivid, we're designating it as more alive than other things, actually possessing a larger measure of life. Where does that measure reside? I would say in a kind of richness, a kind of depth of being - in a sense that the thing we call vivid is more real, more here, more strongly present in the world than other things. In this sense, as I experience it, joy is the most vivid of all emotions. Others can be equally powerful, equally strong (anger, jealousy, grief), but I don't think any other emotion gives us a sense of intense presence the way that joy does. Joy is a vivid experience, and it is triggered by other vivid experiences - being overcome by music or dance, burying your face in a branch of apple blossoms, putting your hands into damp earth. It has to do with tapping into a sense of life, after all, a feeling of livingness. 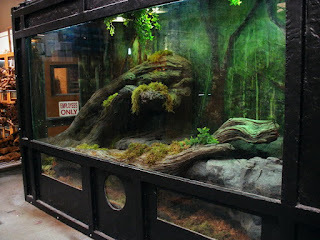 Water Dragon tank at the East Bay Vivarium. Some people who manage to bring a sense of vividness under a roof, who have made a place it is a joy to be in, are the people over at the East Bay Vivarium in Berkeley, California. (Vivarium is an awesome name for anything: it conjures up an image of a Victorian circus tent crossed with a cabinet of curiosity and filled with living things. Or it does for me, anyway.) The Vivarium is one part living museum, one part science center, and one part pet store. There you can see real poison dart frogs (which are even more amazing when you see them up close, dime-sized and brilliantly colored, delicately fluttering their deadly little sticky flanks) , albino snakes, chameleons, turtles, snakes, lizards, giant creatures, tiny creatures, slimy things, scaled things, hissing cockroaches, prehistoric triops, and of course many more. I used to love this place when I was a kid, because it was like going to an aquarium or a zoo, except you could take home the exhibits (although my parents were pet-wary, my dad did almost cave on the baby chameleon at one point.) And there are few animals more vivid than amphibians and reptiles, in a way, because of the wonderful and bizarre ways that they move - especially the small ones. (I have a theory I like to expound on that things in a certain size range have a kind of concentrated form of vividness that makes them especially magical.) I know some people hate snakes and other wriggly things, or find them unpleasant instead of fascinating. So I am not likely to fill the Museum of Joy with a bunch of frogs, although it's tempting. But thinking about the vividness - in color, and feel, and content - of a place like the Vivarium is a wonderful way to wrap my head around the concept of a place that is extra alive, that leaves you walking away all saturated in wonder. My daughter is extremely vivid. Especially tonight. Oh, and we saw ducklings! Hopping ducklings. Oh my god, ducklings. Talk about vivid. Almost all small, young, energetic things are vivid...it's something to do with smallness and something to do with an undamaged sense of wonder at the world, I think.